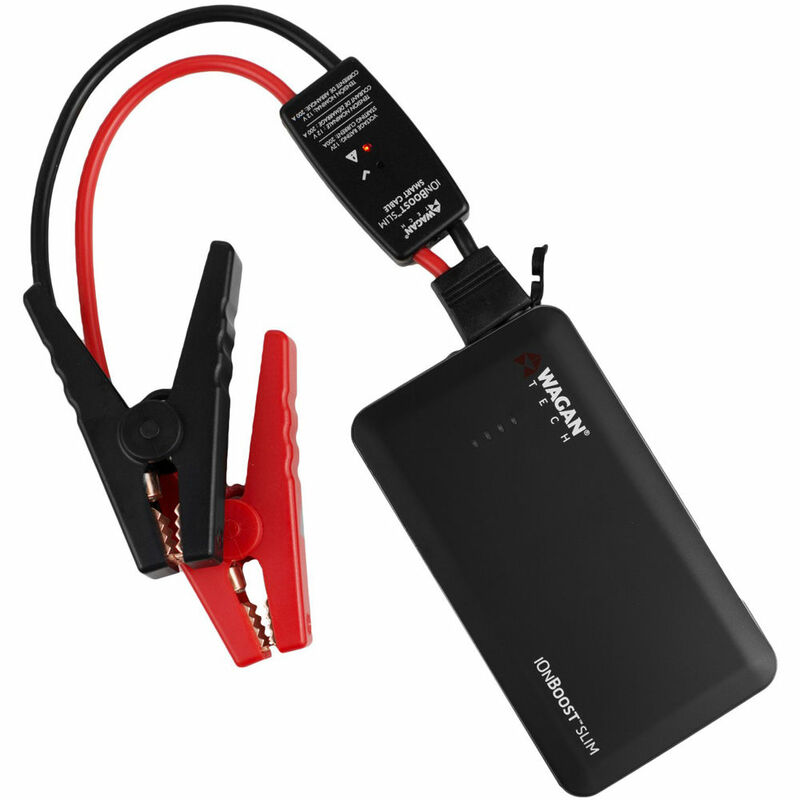 Smaller than a cell phone but powerful enough to jump-start a car: the Wagan Tech iOnBoost Slim Lithium Jump Starter & Power Bank is a highly portable source of power that will keep your devices charged and can save the day in an emergency. Its 20Wh, 5400mAh battery can produce 300 peak amps and 200 cranking amps, enough to jump-start a 6-cylinder car, light truck, or motorcycle engine. Its 5V, 2A USB port can provide two recharges of most smartphones, and its LED flashlight offers on, strobe and SOS flash modes. The iOnBoost Slim itself recharges via micro-USB in about two hours. The unit offers over-voltage, overcharge, over-discharge, reverse polarity, and short circuit protection for safety and features battery status indicator lights. It comes with 8" smart jumper cables made of AWG 10 wire. You can use the iOnBoost Slim in temperatures ranging from -4°F-140°F (but don't store in temperatures below 32°F.) It measures 5.3 x 3.0 x 0.6" and weighs 1.3 pounds. Box Dimensions (LxWxH) 7.0 x 5.0 x 3.0"
can i charge battery with this? No - it is designed for junp-starting a motorcycle or automobile battery only.